Happy Saturday! If you have a loved one having a lazy sleep-in this morning I recommend you win some extra brownie points by whipping up a batch of these delicious Banana Pancakes. This recipe was created after our honeymoon in Bali where Banana Pancakes are as common as Bintangs. Every morning we would wake to freshly cooked pancakes, topped with ripe banana and drizzled with honey – YUM! Sift flours into a bowl, add sugar and stir to combine. Add milk, melted butter and egg; and whisk to combine. Heat a large pan over medium heat and spray with canola spray oil. Add as many of a 1/3 cup of mixture to the pan as will fit. Cook until bubbles appear on the surface on the pancake, around 2 minutes. Turn over and cook for another minute. You can vary the sizes of the pancakes which makes is great for presentation but be mindful that the cooking time will also vary. Transfer pancakes to a plate and top with either another plate or a clean tea towel. I don’t recommend putting them in to oven to keep warm as they can dry out and become rubbery which isn’t fun for anyone. Wipe out the pan, spray with a little more oil and repeat until the mixture is finished. If you find the pan is getting too hot, which it probably will, turn the pan onto a low heat. This should be enough heat to cook the pancakes as you get to the end of the mixture. 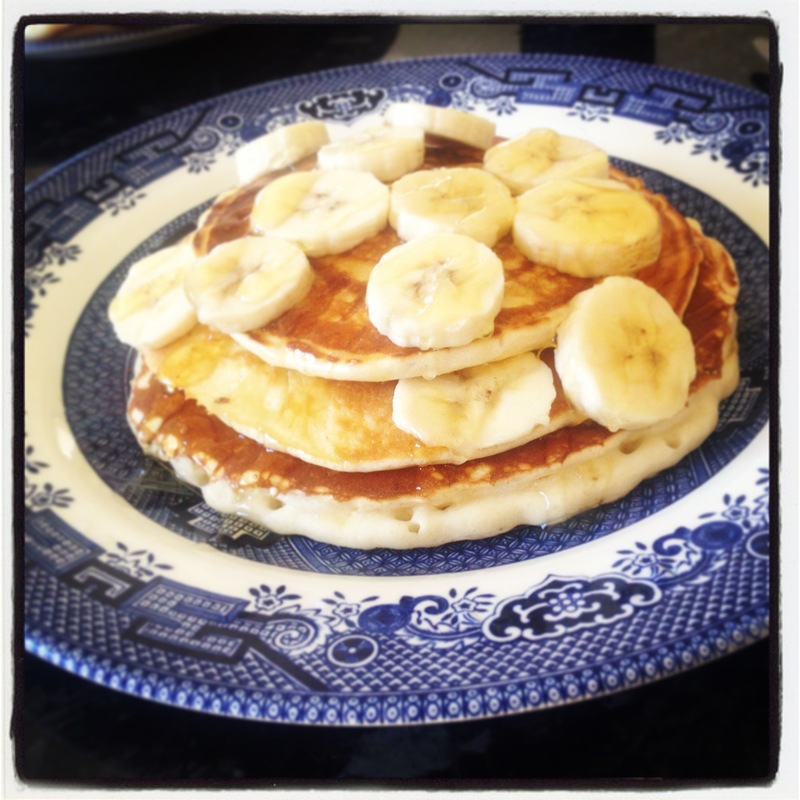 Serve the pancakes stacked on a plate, topped with fresh banana slices and drizzled with honey! Mine too! You can’t go past them. Especially with wholemeal flour, it gives it such a nutty taste. YUM!